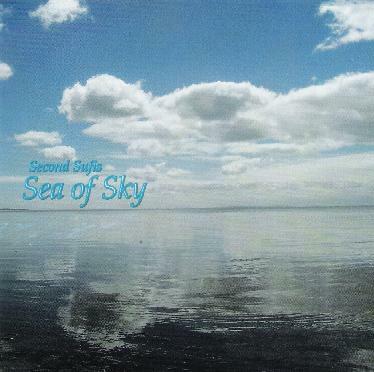 Second Sufis - "Sea of Sky"
Second Sufis are primarily guitarist/percussionist Mike Gorman and Chapman stick virtuoso James Mott, who also plays a variety of ethnic instruments, including didgeridoo. However, on Sea of Sky the duo is also joined by drummer Eric Farantino and keyboardist Jerome Pier. This double CD set includes songs that range from World music to ECM-ish jazz to progressive rock and ambient. Of the two discs, the second one provides perhaps the best showcase for the group's eclecticism. The King Crimson-ish "Wheels in Wheels" shows the group rocking out (as much as progressive rock can be said to "rock out") in a trio format of guitar, stick and drums while pieces like "Midnight Express" and "Sohbet" veer more toward the tribal fusion of Jon Hassell. Both are essentially soundscapes that create impressions of exotic, mysterious and distant realms beyond the ordinary. Pieces like "Sea Foam" and "Perpetual Motion" (from the first disc) utilize polyrhythmic percussion in ways that remind one of Planet Drum's similar excursions. "A River Runs through It," the longest track on either disc, is very nearly trance-inducing. Here a virtual arsenal of ethnic percussion instruments (Buddhist prayer drum, horn drum, gong, Tibetan bowl, to name just a few) create a mesmerizing dreamscape over which Mike Gorman's decidedly Frippian guitar soars. The overall effect is rather like Fripp and Eno jamming with a group of Indian drummers along the Ganges. Other noteworthy pieces include "Ocean Mirror" and "Mosi-au-Tunya" (both from disc one). The former moves again close to progressive rock, particularly in its use of compound meter (6/8, in this case); James Mott's flailing stick really fuels the driving groove this composition generates. "Mosi-au-Tunya" is another voyage into the dark land of tribalism, with lots of resonating didgeridoo and skillfully-handled percussion that give the piece an authenticity its title clearly cries out for. Sea of Sky will certainly appeal to most lovers of fusion music in general but more especially to those who yearn for such music with a veneer of the exotic and the hieratic.